n days past, I was a major fan of Ray-Ban sunglasses. What drew me to them was the look and style (of course) coupled with the fact that they have always used Bausch & Lomb lenses. Since I enjoy photography, I know a think or two about B&L lenses and this solidified my relationship with this outstanding sunglasses manufacturer. Finding it difficult to choose between two styles I liked, I got them both. They're different enough to have their place at different occasions. And besides, having a backup pair is a good thing given my track record with sunglasses. (But I'm going to try extra-hard this time!) One pair I found in-person, the other is coming from Italy. For the pair I ordered, I was able to test size and style in the store, but they didn't have the lens/frame combination I was looking for. Yikes! 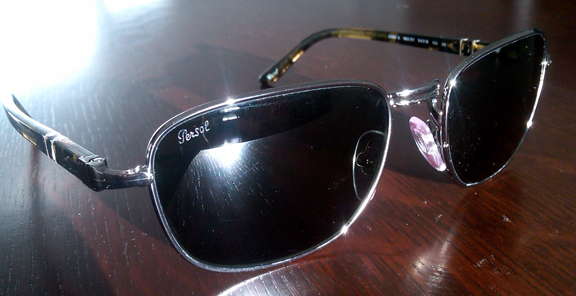 So here's the scoop: 2386-S is the style of the sunglasses....the shape/materials. This has nothing to do with colors. 960 is the color ID of the stem. 31 is the color ID of the lens. 54 is the lens size, and I think it represents lens width in mm. Persol tends to make two sizes in every style...so when you like a style but find it too big or too small be sure to ask a salesperson for help. And hope they're helpful....which they weren't here in NYC. 18 is the width of the "bridge" - the gap between the two lenses. 135 is the stem length. Persol's glasses are handmade and have been iconic for decades. This video gives some background on the history of the company (founded in 1920 by a photographer!!) as well as some insight on the design and manufacture of these amazing glasses. Enjoy! No, I don't but she certainly has a compelling voice. Where did you find this Persol interview?